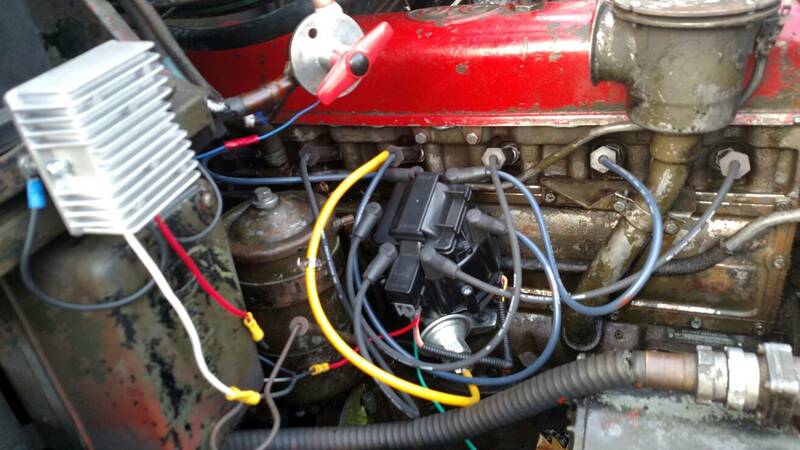 My 74 dodge CT800 has a GM HEI module running the 413 electronic distributor..best piece of scrap i ever bolted to a truck. No more magic box woes.. I ordered 'A team straight 6 HEI distributor' it kinda fits. The shaft on the distributor is probably an inch shorter than it really should be. I had to be a little creative. First thing there is an coolant line running along the side of the engine block that was in the way, to fix this I just loosen the brackets holding it and bent the line down maybe half inch. The distributor I got had a mounting bracket, but the bolt hole was a little too small and off center of the existing bolt hole, so I had to file it larger. The distributor is 12v, but the truck is 24v, so I got a dextron DC DC 24v to 12v 20amp converter. I probably could use a 10amp model, but I did not know the power requirements and figure a higher rated one would overheat less since power draw is so much less than max. Wiring the converter was easy enough, it has four wires, the +24v goes to old wire to original coil, the +12v goes to new distributor, and both -12v and -24v goes to truck frame. For spark plugs I went to local auto store with an original plug in hand and just ask clerk to find a similar, came up with Champion 841 J8C. Maybe not the most ideal spark plug, but it fits and works. I bought ACDelco 9746BB plug wires, these are the wrong sizes, really need plug wire that are 10" to 18" long, which half are, but the other half are closer to 30" long just become a tangle of wire. I plan on trimming the wires down or finding more suitable lengths. The wires plugs work fine, just too long. Now the vacuum advance is where I am having issues. In the pic there is a yellow hose, old semi-ridgid 1/4 tube I had laying around. From the carburator two vacuum lines went to original distributor, one vacuum line goes from governor, the other from closer to the bowl. Through trial and error I found the vacuum line coming from the bowl area should connect to the distributor vacuum advance. I actually had to leave the governor vacuum line open for it to work proper. I am still experimenting with this. It worked the first attempt. I had to advance it and play with it, which is typical of any distributor. Something comes to my mind about the vacuum advance being in series with something else, maybe governor, but I don't recall details (or even if it's the same machine, sorry). Is the end of the distributor shaft a slot? How did you solve the length issue? That's probably why I'll install a kit in my existing distributor. If you have a reference or link for the distributor(s), would you post it please? It has a slot on the bottom that fits into oil pump fine. The issue is the cooler line was in the way, so had to bend the line, and if shaft on distributor inch longer, there would be more clearance between it and engine block, to allow better heat dissipation. Long story short, I just shoved it in, and it works. I found the one for my 390 Ford from your link, same people. It would be nice to have all new if it fit right. I am looking into split brake system now. There are a lot of threads about this, mostly for the cousin truck m35. I want to run this idea by some others to see if I am on base. Since G-749 is a gas engine I can run a car style vacuum brake booster, which lead me to the f-550 brake booster and master cylinder. The research I came across implies that the f-550 brakes are good for towing up to 40k, or truck designs in the 18k range. I don't know if the f-550 master cylinder with fit where the current master cylinder at, I may have to make some custom brackets and such. I also plan on installing new brake lines, new rubber hoses, new steel lines, new fittings. On a typical split brake system, the front brakes are separated from the rear brakes, deuces have three axle, so not sure if it that holds true. The G-749 have two wheel cylinders per brake, I was thinking on splitting them that way. So in my idea would have the upper wheel cylinders be controlled from the front split on the master cylinder, and the lower wheel cylinders controlled from the other. The hope would be if I had a failure all my brakes would work, just at half power. A quick price put the job about $300 to $400. Anyone have ideas, or advice to from someone who installed split brakes on G-749 trucks. Re brakes, are the F550 front a drum brake or disk? 2x4 or 4x4 have 4 brakes and your truck has 6. Have you calculated volumes? Are the outlets the same size or different on the F550 MC? Disks use less pressure and flow (I think). Size of the outlets will give an indication if it's 50/50 or something else. Myself, I'd keep it more conventional with front circuit and rear, not a hybrid. And keep a well maintained emergency brake. If it were me, I would look more into how the m35 dual system is set up, I believe they are set up so the front axle is on one circuit and the rear axles on the other. Interesting idea, but splitting the upper and lower wheel cylinders would most likely not work, at least not anywhere near the 1/2 power of brakes you expect. With only one cylinder actuated only 1/2 (upper or lower) of the shoes would move, however without the other cylinder functioning the shoes would have room to move within the drum, so at best you might have 1/4 brake power. Long story short, the brake system on the G-749 series is designed to stop when both cylinders are actuated simultaneously. When properly adjusted, a stock brake system with the air booster will stop the truck on a dime and give you 9 cents change, at least. As an aside, my M211 has the stock brake system, I had a wheel cylinder start to leak in October/November of last year, and I didn't fully lose brakes until February. Please keep us in mind as you pursue a dual circuit system, I know I for one would like to see what you come up with. My M35A3 has a dual circuit 50/50 system. The 2 front WC are 1 1/2" piston and the (4) rears are 1 3/8". On a single circuit M35A2, all 6 are 1 3/8". I'm going 4x4 and all four to 1 1/2". The 1 1/2 and 1 3/8 piston wheel cylinders can be interchanged on M35's. There are many threads on engineering brakes for the early M35. I'd perhaps look into going to the M35 style brake and backer plate with a single cylinder. Volume may be a problem with 12 cylinders acting in unison for modern MC. The M135/211 brakes if working properly with stop on a dime and give you back 9 cents change. The system is very good provided everything is working properly. Unless you are planning on driving the truck everyday I wouldn't worry about splitting the system. Make them work good and enjoy.